This evening was another gorgeous, cool evening here. I always enjoy cooking more when it is cooler outside for some reason. I was in the mood for Chicken Parmesan and I just happened to have a package of 2 boneless chicken breasts in the fridge that needed to be used. 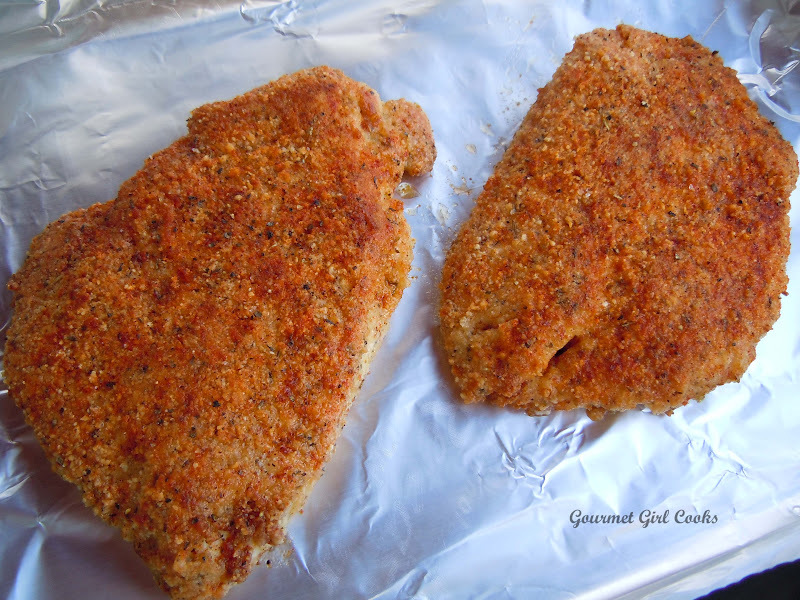 I seasoned some almond flour and mixed it with Parmesan cheese and made crusted chicken breasts to use for the Chicken Parmesan. It was a fairly easy dinner to put together. 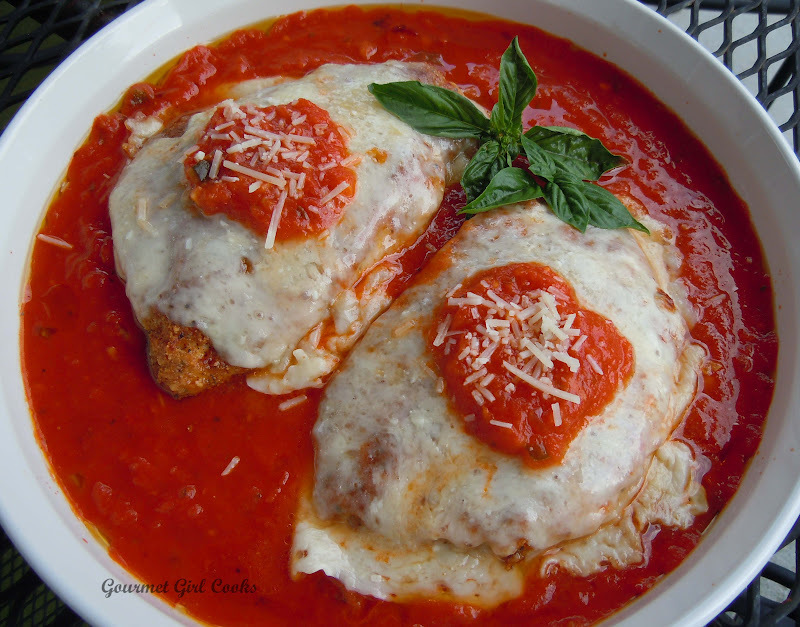 I used a jarred sauce by DelGrosso and topped the cutlets with Mozzarella, Provolone and Parmigiano Reggiano (which is an aged Parmesan from a particular region in Italy and has a little stronger flavor than regular Parmesan and is also a bit pricier too)...but it is really good. 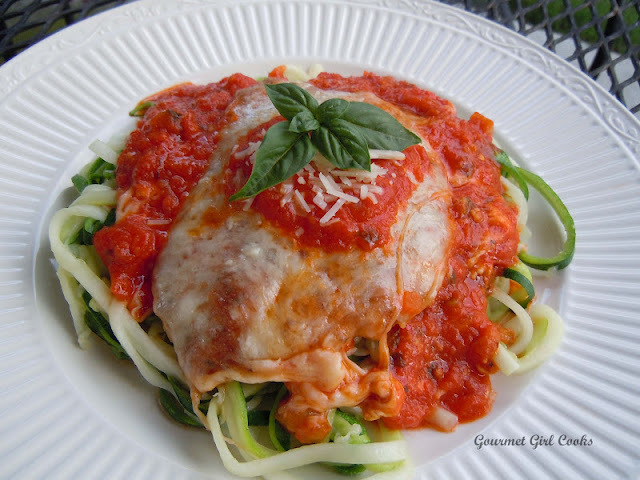 I served my Chicken Parmesan on top of zucchini linguine (I love saying that...it's like those two words were meant to be together). Hubby had his over penne pasta. You can easily adjust, change or omit the seasonings and amounts -- it is a forgiving recipe and by no means "exact". I snapped a few photos below as well as the quick and easy recipe I put together. Enjoy! Preheat oven to 350 degrees F. Combine all breading ingredients (except paprika) in a shallow bowl. Beat eggs and all egg-wash ingredients in a separate medium bowl until well blended. Dip chicken pieces into egg-wash until evenly coated and allow excess to drip off. Roll chicken into breading mixture until well coated and cook at medium-high in a non-stick skillet lightly coated with olive oil and/or coconut oil (1-3 tablespoons, depending on the size of your pan). Cook until lightly browned on both sides and done. Sprinkle lightly with paprika and additional salt and pepper, if desired. If the breading begins to brown faster than you'd like, you can transfer the chicken breasts to a baking pan lined with foil and bake for about 10 minutes or just until done in a 350 F degree oven. Do not overcook the chicken, cook just until done (cooking time varies depending on the thickness and size of your chicken breasts). 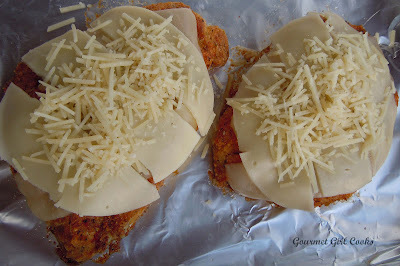 Pour pasta sauce in a shallow baking dish and place the cooked breaded chicken breasts in the sauce (not submerged, just on top of) and layer the provolone and mozzarella slices on each chicken breast and top with the shredded Parmigiano Reggiano (or Parmesan) and place back in oven and bake for about 15-20 minutes or until the sauce begins to bubble and the cheese is melted. 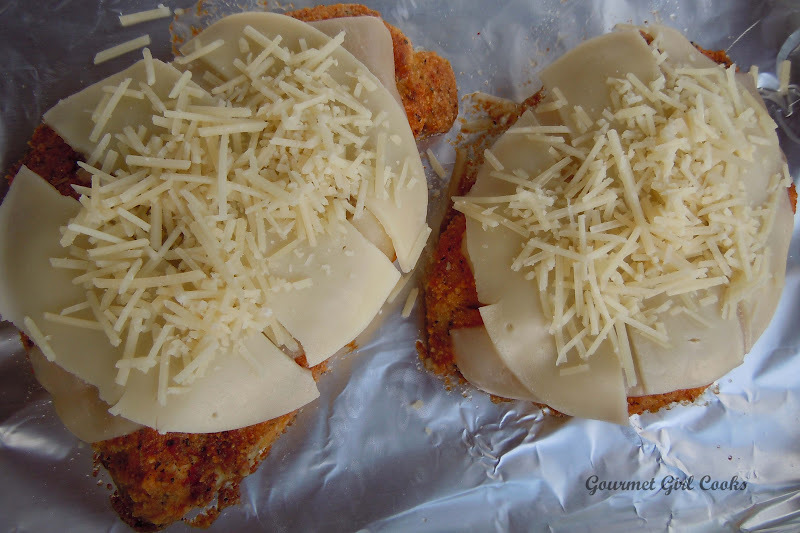 If desired, run it under the broiler for a few minutes to brown the cheese a bit. Serve the Chicken Parmesan over the pasta of your choice. I made this recipe exactly as directed and it was delicious! Thanks so much for sharing it. My husband and I really enjoyed this recipe! It works really good with chicken thighs. Thank you for sharing this recipe. We recommend it. I can't wait to share it with the rest of my family especially my mom. Thank you again. Blessings to you! OMG, this was amazing. I made this for our family dinner (kids, grandkids), 9 adults, 4 kiddos. Usually I have to make a separate recipe for DH and myself as we're wheat free 6 weeks. Made it for everyone and they gobbled it up. I just substituted spaghetti squash for us. Your breading is so delicious I knew it would be great on my chicken fried steak. I have missed this since I've gone wheat free. This is THE BEST COATING EVER! We just ate the most amazing chicken fried steak, whipped cauliflower (I've got that recipe down to a super quick delicious side). I even removed extra oil, left drippings and made the perfect wheat free gravy (arrowroot powder, cream and spices). Couldn't have done it without your recipe so had to let you know. Thanks so much. I am so happy you and your family enjoyed the Chicken Parmesan and thrilled you were able to use the breading to enjoy on of your favorite recipes for chicken fried steak! I skipped the cayenne but followed the rest. WONDERFUL! Even tried it with eggplant. You would never know that it wasn't traditional bread crumbs.